This CE course is based on the recently published book by the same title: Forgiveness Therapy by psychologist Dr. Robert Enright and psychiatrist Dr. Richard Fitzgibbons. Publication of the book itself by the APA signifies that Forgiveness Therapy is now rightfully taking its place alongside such historically accepted therapies as Psychoanalysis, Humanistic Psychotherapy, and Cognitive Behavioral Therapy–a huge step forward for forgiveness. This course will help you understand the significance and capabilities of forgiveness therapy. The course work includes the empirical foundations of forgiveness therapy, process models of forgiveness interventions, and the clinical application of forgiveness in a variety of clinical presentations such as depressive and anxiety disorders, substance abuse, eating disorders, marital and family adjustment disorders. The goal of the home study course is to provide professionals: 1) with an understanding of the empirical basis for forgiveness in therapy; 2) with a working knowledge of the psychological processes of forgiveness; 3) with an understanding of the relevance of forgiveness for many clinical presentations; and 4) with clinical expertise in applying the forgiveness process to his/her own practice. Enroll now by clicking the "add to Cart" button below. While Forgiveness Therapy is the required course text, all course work is offered online. The cost is $175.00. Licensed psychologists who successfully complete the course will receive 15 credit hours from the American Psychological Association (APA). The book Forgiveness Therapy must be purchased separately. The book can be ordered on Amazon.com or from the APA. In addition to the Forgiveness Therapy text, students gain insight from an instructor-prepared Content Summary that accompanies each unit of the text; Read Chapter One. The faculty includes Dr. Robert Enright, Licensed Psychologist and Professor of Education Psychology, and Dr. Elizabeth Gassin, Professor of Educational Psychology at Olivet Nazarene University, Bourbonnais, IL. Both these instructors have more than 20 years of experience researching and teaching about forgiveness. The following links will enable you to view the full CV of each of the faculty members: 1) Dr. Robert Enright; and, 2) Dr. Elizabeth Gassin. This course was developed for Licensed Psychologists who are only now learning about the psychology of forgiveness as well as those with intermediate and advanced knowledge in the area. It has also proven beneficial, however, for ministers, psychiatrists, social workers, nurses, and other professional counselors who have completed it. Enroll now by clicking the "add to Cart" button below. The International Forgiveness Institute is approved by the American Psychological Association to sponsor continuing education for psychologists. The International Forgiveness Institute maintains responsibility for this program and its content. "My time studying at the Forgiveness Institute gave me more tools to better treat my clients, to measure their progress and to encourage them to strive for a better and more meaningful life." 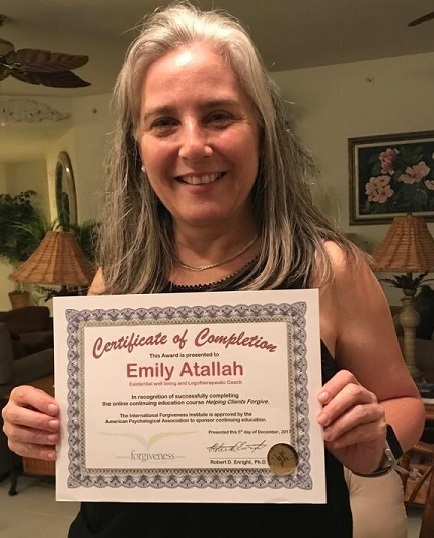 < Emily Atallah with her Forgiveness CE Course Certificate of Completion. "Overall, as a healthcare chaplain and a clergy person, the Forgiveness Therapy course equips me to think about and to work with forgiveness in a practical way that bridges the gap between the theology and theory and the everyday need for many to start to do something more constructive with their anger." YOU, too, can use Forgiveness Therapy in your practice. Enroll now by clicking the "add to Cart" button below.